George Clayton Johnson and Bettina Bradbury. 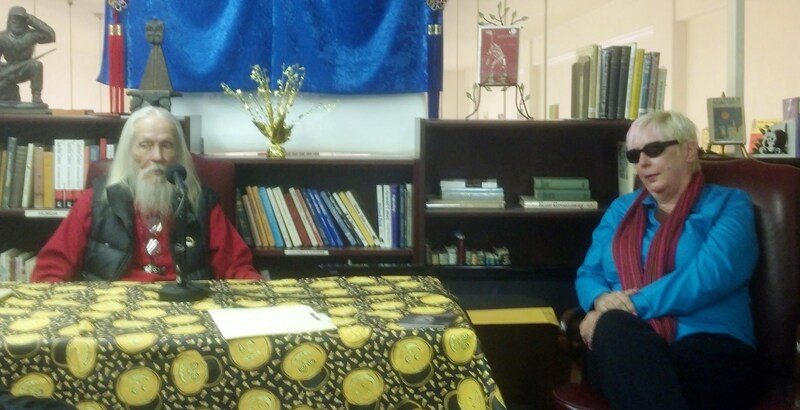 By John King Tarpinian: Today was a semi-regular talk by George Clayton Johnson at Mystery & Imagination in Glendale. George is always fun to listen to about his writings and experiences with other people of note. (Have some fun and Google Café Frankenstein in Laguna Beach, CA.) Around 50 people showed up for today’s talk. A few regulars were Peter Atkins and Dennis Etchison. But this time we had a drop-in guest who to everybody’s delight was more than glad to share with the audience some of her family experiences, Bettina Bradbury, daughter #3. Imagine coming home after seeing a movie you just hated. In this case, Burnt Offerings. A family friend was visiting and asked what she thought of the movie. Tina went on and on about plot holes, bad dialog, etc. The family friend was William F. Nolan — who wrote the script. Oops. She talked about her dad’s sense of humor. Her dad, Ray Bradbury (assuming you did not see the resemblance in the photo) was working on a project with Sam Peckinpah. They had a disagreement about the project. So the next day Sam sends Ray a cactus and a jar of petroleum jelly. Ray got the inference and laughed and laughed. With her dad’s favorite day of the year almost upon us she talked about all four girls going trick-or-treating with their dad as the chaperone. They quickly learned to not let their dad hold the pillow cases of treats for fear their Butterfingers would soon be gone. The daughters had to hide their candy once they got home. Tina talked about just having breakfast with the family and then going off to school. There was an assembly that day and she was unaware who the guest of honor would be. Yep, it was her dad. This was the first time she had ever heard her dad talk to an audience. George talked about the first time he met Ray and how he convinced Ray that his story, “Icarus Montgolfier Wright,” would make a good film. The images were done by Joseph Mugnaini and voiced by Ross Martin. (Remember the TV show, Wild Wild West?) It was screened for only twelve days at a theater in Westwood, CA. The little piece that Ray thought could not be turned into a film wound up being nominated for an Oscar. It did not win but is in-line for a complete restoration by the Motion Picture Academy. Well that was my surprise day. The people in attendance were delighted with the surprise guest. This entry was posted in Like Show Business and tagged George Clayton Johnson, Ray Bradbury by Mike Glyer. Bookmark the permalink.